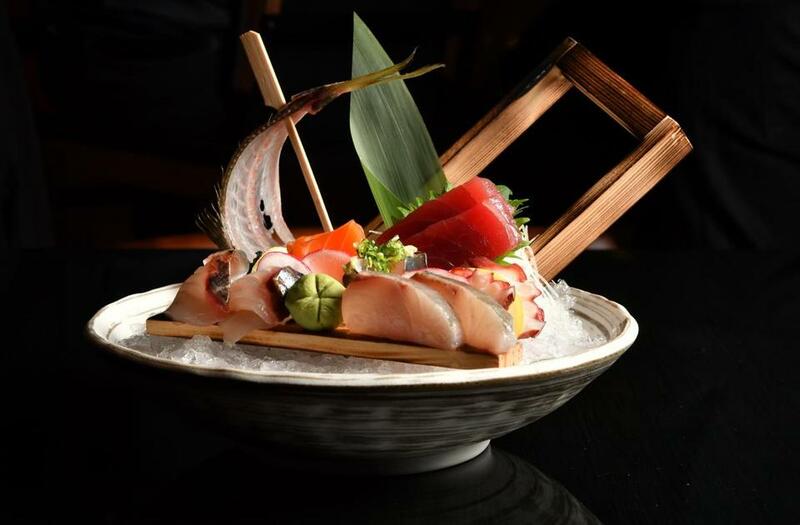 Sashimi at Pabu, the new Japanese restaurant in the Millennium Tower in Downtown Crossing. The scene Steely Dan is playing in the elevator on the way up. Orchids greet you as you enter the restaurant. A bar and lounge area is shrouded in darkness, which gives way to the golden glow of the dining area. Traditional Japanese design elements are translated into tasteful restaurant decor. A wooden structure akin to a temple gate frames booths where groups of 20-somethings chopstick up slivers of sashimi and drink sake; at the end of the room is a sushi bar backed by a gold wall painted with cranes, in the style of a Japanese screen. Huge windows offer a view of Downtown Crossing (I can see you, guy prancing around at the BSC across the way); flocks of flickering candles light the way to the restrooms. The bar is busy, populated by men in button-downs and sweater-clad couples sipping craft cocktails. What you’re eating Executive chef Ben Steigers hails from San Francisco’s Pabu. He offers up small plates like the one-bite “happy spoon” oyster, topped with sea urchin, roe, and more; house-made tofu; chicken karaage, fried with ginger-soy marinade; mushroom tempura; and lobster okonomiyaki, a Japanese snack that falls somewhere between omelet and pancake. There’s a selection of robatayaki, grilled skewers of chicken parts, pork belly, and more. The sushi bar sources fish from Tokyo’s Tsukiji Market as well as New England. And then Pabu turns into a high-end steakhouse, incorporating Japanese flavors on the meat and in the sides (bonito in the potato puree, shiso with the crunchy lotus root). Care for a drink? If you’re interested in Japanese whiskey or sake, come here: Both are a focus. Cocktails are thoughtful and creative, from the Eighth Virtue (junmai sake with vodka, pineapple gum, lemon, and cardamom) to the 2 Dots & a Dashi (Japanese whiskey with dashi and bitters). There’s also wine and mostly Japanese beer.